The wide field of potential Democratic candidates for Governor just grew by one. Kathleen McGinty, the former Pa. Department of Environmental Protection Secretary and a Clinton administration alum will form an exploratory committee this week, PoliticsPA has learned. According to a document obtained by PoliticsPA (below), McGinty wants to be able to collect contributions as she weighs a possible campaign. Her name has been floated for months among some Democratic politicos, several of whom told PoliticsPA that McGinty has called them in recent weeks to solicit support. PoliticsPA was unable to reach McGinty for comment, but a source close to her confirmed that she is seriously exploring a bid. 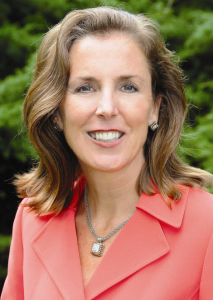 The source confirmed that McGinty filed to form the committee Monday, saying she is eager to have a destination for the roughly $1 million in preliminary fundraising commitments she has collected to date. McGinty filed the paperwork with the Pa. Department of State on Monday. It will be official upon the department’s approval. A Senate advisor to Al Gore, McGinty rose to become the Chairperson of the Council on Environmental Quality for the Bill Clinton administration from 1995 to 1998. Rendell tapped her as DEP Secretary from 2003 to 2008. McGinty, 49 and a northeast Philly native, lives in Wayne in Chester County with her husband Karl Hausker (who is listed as the chairman of the exploratory committee). He has a PhD in economics. The couple has three daughters. If she gets in, she won’t be the only Rendell alum – not even the only former DEP Secretary. Her successor, John Hanger, announced his candidacy late last year. Former Revenue Secretary Tom Wolf has also said he is likely to run. She would complicate an already busy field of potential challengers to Gov. Tom Corbett. The top tier on the Democratic side comprises Pa. Treasurer Rob McCord and Congresswoman Allyson Schwartz, both of whom have signalled their intent to run. Former Congressman Joe Sestak would also be formidable. 2 Democrats who said they’d received calls from Schwartz and McGinty told PoliticsPA that Schwartz, formerly the recruitment chair for the Democratic Congressional Campaign Committee, was trying to encourage McGinty to challenge Rep. Jim Gerlach (R-Chester) instead. But the source close to McGinty said Congress was not on the table. Though McGinty has not held public office, she could prove to be a potent fundraiser – thanks in no small part to her thick rolodex of Clinton, Rendell, and private sector contacts. McGinty or Wolf would be most likely to enjoy the benefits of the remaining Rendell fundraising network, said one source close to the former Governor. “If Tom Wolf or Katie McGinty gets in, he will turn on the Philadelphia spigot. He won’t turn on the Philadelphia spigot for Rob or Allyson,” said the source during the winter meeting of the Democratic State Committee. Given, Corbett’s consistent polling gap among women, many have argued that a female candidate would provide the starkest contrast for Democrats. For the few weeks since former Congresswoman Kathy Dahlkemper announced she would skip Guv to run for Erie County Executive, Schwartz was the only woman in the running. Hanger and Cumberland County minister Max Myers are the only declared Democrats so far. Montgomery County Commissioner Bruce Castor has floated the possibility of a GOP challenge. She just resigned and the companies CEO was forced out and 150 employees let go. Nice work Katie! Great springboard where you can cite your incredible business acumen! You’re right, it is very easy to change the name of a political committee in Pennsylvania. Another point demonstrating naivete, or perhaps even ignorance, is that McGinty and her “team” formed an “exploratory committee.” Federal campaign finance law (where forming an “exploratory committee” or “testing the waters committee” has significant benefits) is very different from Pennsylvania campaign finance law. Perhaps if McGinty and her “team” knew anything about it or consulted a real professional, they would understand there is no benefit to, and in fact there is no such thing as, an “exploratory committee” under Pennsylvania campaign finance law. He campaign operation promises to be an object lesson in what not to do. Katie, stop it. No experience in elective office, no experience as a candidate for ANYTHING, and you’re trying to jump right in to a governor’s race? You’re wasting everybody’s time, and possible diluting a primary field where the dems have an excellent chance of nominating a strong candidate and taking corbett out. This reeks of vanity. @Rob: Good catch. I don’t think many people aside from donors ever realize official committee names, but it still goes to your larger point. I imagine she could change the name if the exploratory committee finds something and ceases exploring? Pity Ms. McGinty didn’t take Allyson’s advice to run against Gerlach. That dude is ripe for the picking, but the guy who’s gone after him the last couple times (Trivedi) has been unknown and underfunded. Ms. Ginty may be unkown, but she wouldn’t be underfunded. She’s aiming a little too high for a newbie, and her apparent selling point (I’m Not As Liberal As Allyson Schwartz!) is a distinction without a difference. Perhaps she’s really working for Rob McCord. A candidate naming her authorized candidate’s committee the “New Jobs, Bright Future PA Committee” is a rookie mistake. It is legal in Pennsylvania, but it is advisable you include your name (at least your last name) in the political committee. Calling it the “New Jobs, Bright Future PA Committee” will not convince a single person to make a contribution, and it may confuse donors. In the end, it won’t cost her an election, but it signals she is a campaign novice, that she didn’t seek the advice of a professional who knows what to do, consulted an unknowing professional, or that she already is not listening to her advisers. Katie, Katie, Katie. Don’t make Allyson tell you twice. There is only room for one SEPA female in this race. Get out.